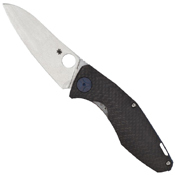 The blade of this knife is full-flat ground from CPM-S90V stainless steel and features a tumbled finish. It is paired with a stylishly ergonomic handle that includes a titanium scale on one side and a solid carbon fiber scale and nested stainless steel liner on the other. 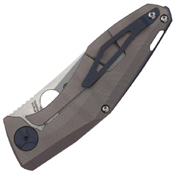 The titanium scale is “webbed” to reduce weight and forms the basis for the knife’s Reeve Integral Lock (R.I.L.) mechanism, which includes a long-wearing stainless steel interface.